Rock on all day with no commercial interruptions, and enjoy all of your favorite channels without hearing or seeing advertisements. 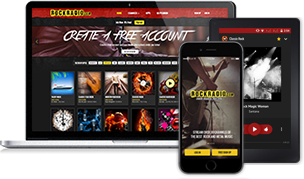 Listen to the highest quality audio streams with ROCKRADIO.com Premium. They're twice the quality as the free options! Compare the sound quality and hear the difference for yourself. ROCKRADIO.com is now part of our network along with the following Internet Radio services - so your Premium Membership will work on their channels too! ROCKRADIO.com is more than just a radio station playing music... these guys are true fans! I love the diversity of what they play and the level of support that they show to up-and-coming artists! Anyone who has yet to check out Premium needs to do so ASAP!!!! ROCK ON!!!!! ROCKRADIO.com Premium is SIMPLY THE BEST! ROCKRADIO.com is amazing! They have a great selection of music - no matter what mood I'm in, I can always find something that catches my attention. They not only play music from known artists but also give up and coming artists a chance to have their music be heard. To me ROCKRADIO.com is an open door to good music, all the classics in the history of Rock, from the 60's until now! Thanks to you I've found at least 30 new bands and I became a fan of them. There's not a day that I don't listen the your music!